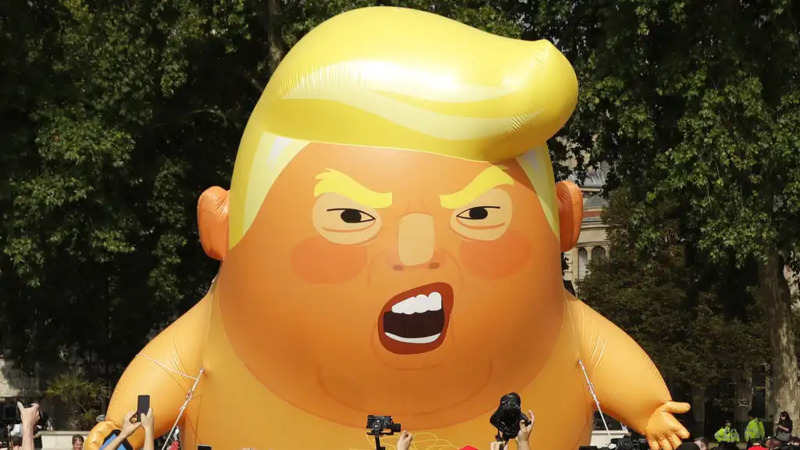 The last of the thousands of anti-Trump protesters in Edinburgh have arrived at The Meadows, a park in the Scottish capital where a giant balloon depicting President Donald Trump as an angry orange baby is floating in the air. 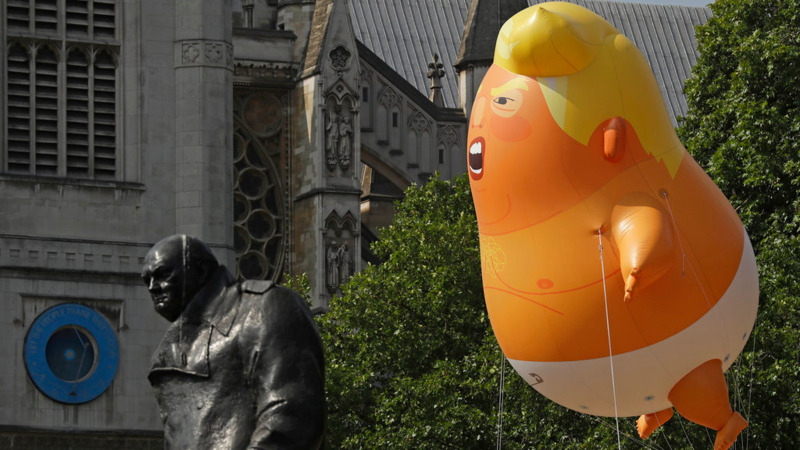 The 20-foot (6-meter) tall balloon has become a symbol of the protests against the U.S. president's first official visit to Britain. 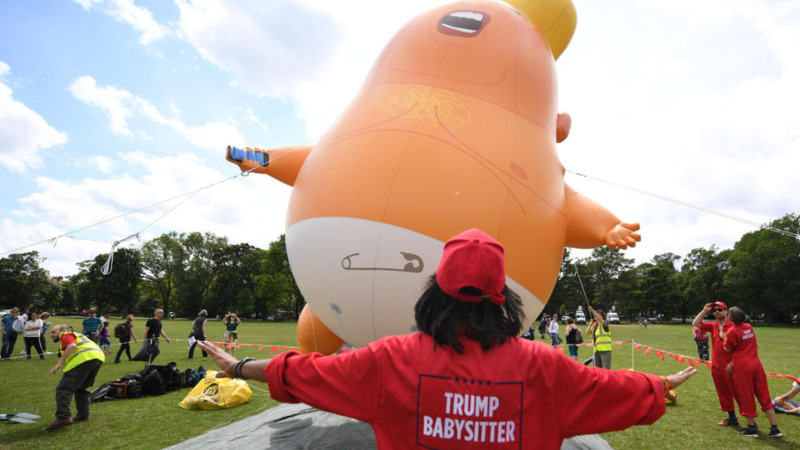 Many of the demonstrators carried placards bearing images of the "Baby Donald" balloon, along with the slogan "Dump Trump." It took two hours for the march to weave its way through the city Saturday, much to the amusement of tourists and motorists, who beeped their horns in support. A dozen demonstrators have staged a protest picnic on the beach in front of the Trump Turnberry golf resort in Scotland where President Donald Trump is spending the weekend with the first lady. They chanted "Trump is a racist! Trump is a liar!" as other hotel guests played golf just 100 meters (yards) away Saturday. Separating the protesters from the golf course was a line of police, some on horses. Snipers were also perched atop a nearby tower overlooking the vast property. The resort is one of two golf hotels owned by Trump in Scotland. More anti-Trump protests are taking place Saturday in other parts of Scotland, including one with some 10,000 people in Edinburgh. 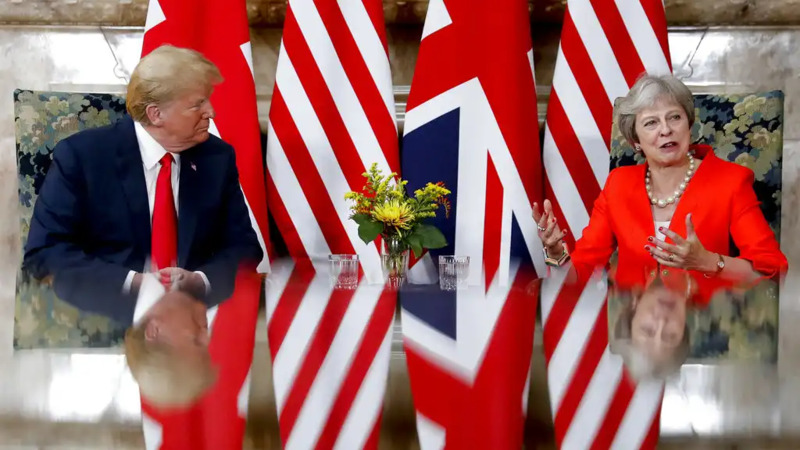 Tens of thousands also protested in London on Friday against the U.S. president's first official visit to Britain. Dozens of protesters have rallied outside President Donald Trump's golf resorts in Scotland to protest his visit. Most of those protesting outside the Trump International Golf Links in Aberdeenshire, on the eastern coast of Scotland, were peaceful. One woman climbed onto a wall surrounding the golf resort, before she was helped down by police. Others are demonstrating outside another Trump golf resort in western Scotland's Turnberry, where the president is staying for a private visit this weekend. Thousands are also protesting in the capital Edinburgh. New Yorker Ibis Robinson, who has lived in Scotland for years, said she came to stand up against "the hatred and bigotry against anyone who isn't white." "There's no way I'm going back," the 61-year-old said. "Even if he's only there for four years, every four years we have an election and there are 67 million people who support him, so what are the chances that this is the end? That's the worrisome thing." Thousands of people are marching through the streets of Edinburgh to protest against President Donald Trump, who is staying in Scotland over the weekend. Police estimate the number of people gathering outside the Scottish Parliament in Edinburgh for the start of the demonstration at up to 3,000. Anti-fascist groups and political activists were joined by many others who say they had never demonstrated before. Waving an array of makeshift anti-Trump banners, the l protest will go past the American Consulate, which is protected by heavy security. Trump is spending the weekend out of the spotlight, staying at his resort in Turnberry in western Scotland ahead of his summit with Russian President Vladimir Putin in Helsinki, Finland. Scottish police say they are trying to trace a paraglider who flew a Greenpeace protest banner over the golf resort that President Donald Trump is staying at. The glider carried a banner reading "Trump: Well Below Par" on Friday night to protest his environmental and immigration policies. Greenpeace claimed that the protest forced Trump to take cover, with a statement saying "as the glider appears overhead the president can be seen making for the entrance breaking into a trot." Thousands of people are expected to join anti-Trump protests across Scotland on Saturday.